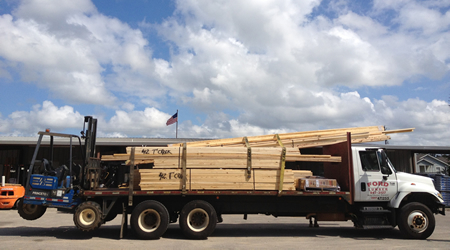 Jobsite Delivery | Ford Lumber & Millwork Company, Inc.
We know that delay in supply delivery can end up costing time and money. With our three strategically located facilities, we provide timely delivery throughout the Mobile and Baldwin County region – and beyond. We typically provide same-day service on all local in-stock orders placed before 11 a.m. and next-day delivery on in-stock orders placed after 11 a.m.* If specialized placement of materials is a must on your job site, just provide instruction when the order is made. Most of our delivery trucks are equipped with piggy-back lifts that are mobile enough to reach just about anywhere on your job site. *Some limitations apply.